This is the grand opening weekend for Schweitzer Mountain Resort and the unofficial kickoff to summer for Sandpoint and Bonner County! To celebrate, Bonner County businesses and nonprofit organizations are invited up to Schweitzer so the community can sample the best that the county has to offer all in one place. Local restaurants, retail stores, beer and wine producers, artists and musicians – all at Schweitzer for the day! In addition, unlimited rides on the Great Escape Quad will be FREE! Schweitzer’s summer amenities will be in full swing, including the trampoline jumper, zip line, climbing wall, mountain biking, hiking, geocaching and tennis. At the top of the Great Escape Quad there will be refreshments, hiking, biking and more! 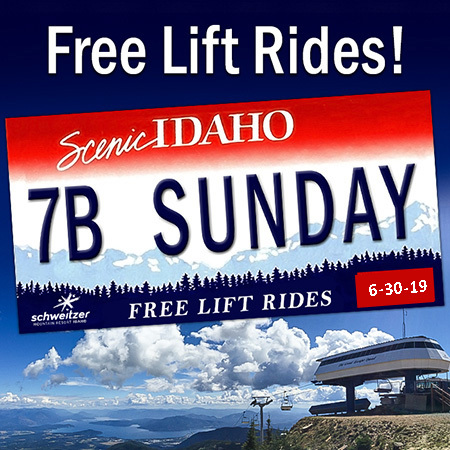 FREE Chairlift rides 11 a.m. to 5 p.m.! Pick up your free ticket at the ticket window to enjoy unlimited rides on the Great Escape Quad. FREE live music in the village!